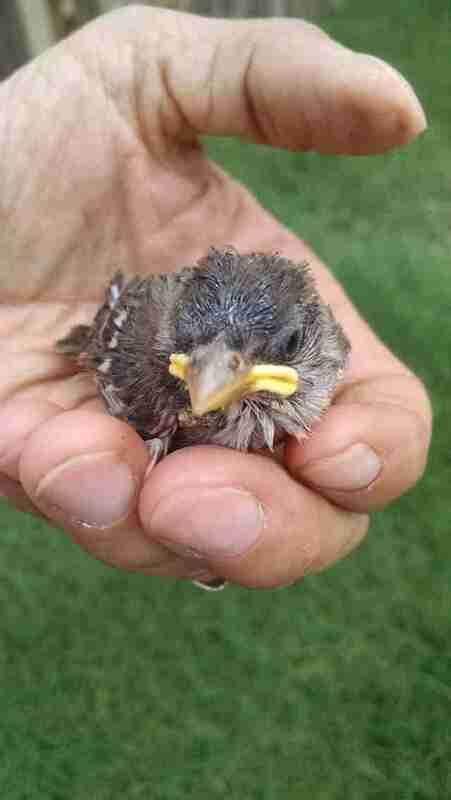 Henry, the hatchling sparrow, fell from the rafters of my barn in the middle of June. 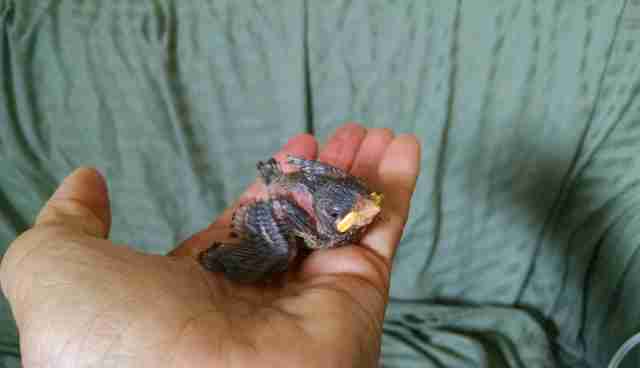 He had no feathers and he was so young that his eyes were still shut. 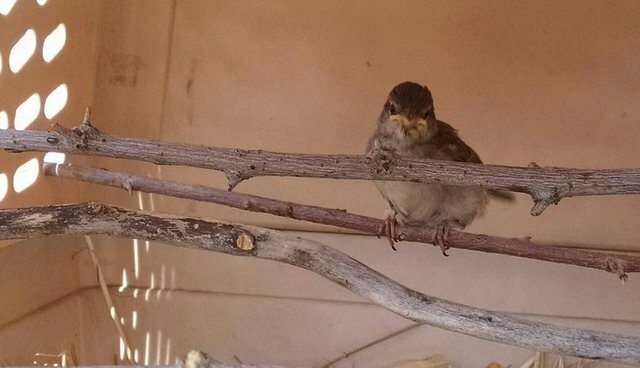 I couldn't reach the nest he had fallen from with a ladder so I tried to put Henry in a make-shift nest as high as I could get it in the barn hoping the mother bird would come care for him. But she didn't. I called wildlife rehab but they didn't have room for a sparrow so young. They said he had less than a 5% chance of making it and they didn't have the staff or the time to take him in. 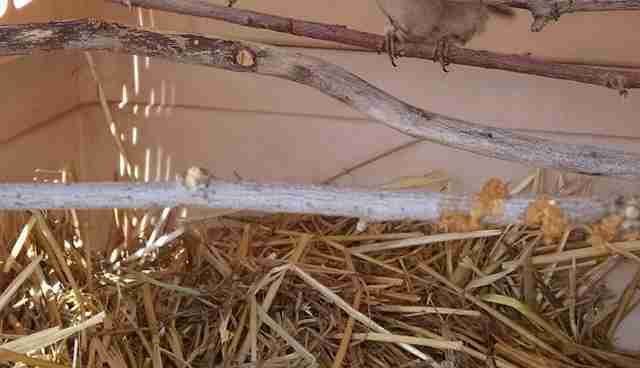 So, I researched what to feed baby birds and how to care for them. 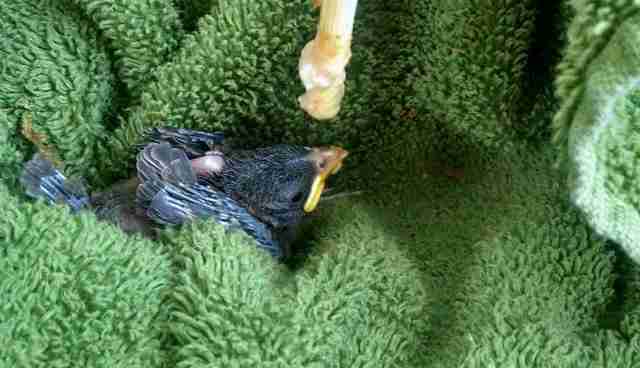 There wasn't a whole lot of info but most resources said baby birds that young were not going to make it without a mother bird. Henry deserved a chance so I wasn't going to give up on Henry. He was so brave and such a happy fighter that I was going to put my heart into it. I made him high protein meals in the blender, fed him with a chopstick and carried him around in a little box. I fed him every hour at the office and at home (except at night). He seemed to be thriving. He responded to my whistle when I walked in. He would pop up from his nest with his mouth open and eat like a champ. After 2 to 3 weeks, I thought he might be ready to start flapping his wings and practice balancing on twigs. So, I got him a cat crate and put twigs in one side and out the other so that he could sit on them and learn to balance while exercising his wings. He soon began to jump from twig to twig and chirp away. He seemed to love his new playground. That crate with Henry in it, traveled with Happy (my therapy dog) and me to the office every day and home again. He slept in my bathroom at night so that he was close but my dogs wouldn't get too interested. I took him out almost every night when we got home from the office to begin to practice flying exercises. He would sit on a low branch and flutter to the ground then run towards me. 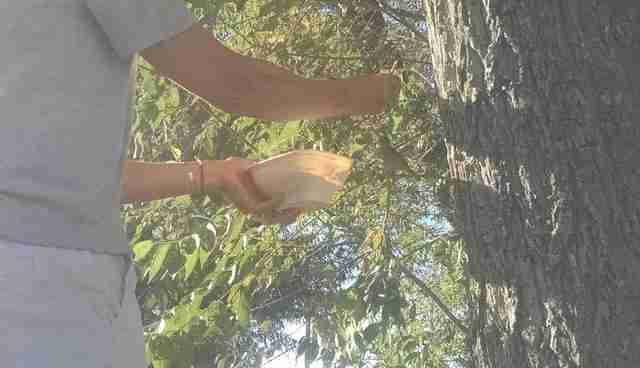 I would chuckle at his tenacity and then put him back on the branch and he would do it all over again like it was his very first time. He seemed to be getting ready to fly. He acted like he wanted to try so I set up some tall branches (cut from our trees) in our little barn for him to practice flying in. I closed the wire doors to the little barn so that he wouldn't get lost while he was learning to fly from branch to branch. Henry could practice flying while I was close taking care of our other animals. I kept an eye on him while I worked and he would chirp loudly whenever I would walk by, almost like he wanted me to stop and watch his new accomplishments. Of course, I did and he would show off like the real ham he is. He flew around from branch to branch and started getting really good at navigating the branches. One night in early July, Henry was out with me and he was flying from the hay stack to the pick-up truck and back again. He had made this loop several times. Then it happened, he lifted himself up to a tall tree and just sat there on a branch. Way up on a high branch. It was dusk and he was sitting in the tree that wasn't too far away from the hawk's nest. I whistled and called him but he didn't budge. He just sat right in that one spot on the branch. I sat on the ground and watched him until it got dark then went inside for the night. I knew there was nothing I could do. I just had to trust him in his natural environment. Henry decided he was going to stay in that big tree that night and so he did! I went out the following morning very early and he was gone. So, disappointed, I went back inside to do some catch-up work and as I was working on the computer early that morning I saw a cluster of three sparrows outside my window. 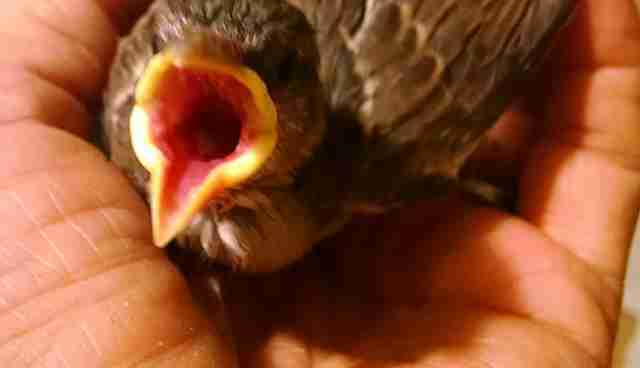 The "mother" was putting insects from the sidewalk in a young sparrow's mouth! I thought it looked like Henry. I hoped against hope that it was Henry and he had already found a group of birds to call his family. But I knew that was a far fetched notion. I finished working and walked outside to start serving breakfast to all the rescued barn animals we care for. Then I heard that familiar chirp! There was Henry in the tree by the deck chirping at me! He flew low towards me to make sure I saw him. I ran in to get his food and returned to the tree that hung over our deck. 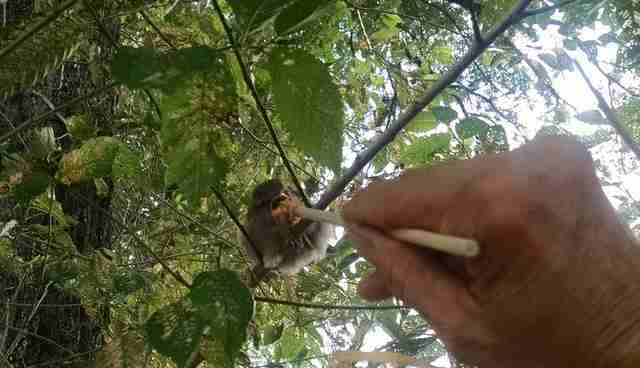 He flew down close and sat on a branch while I fed him with the chopstick. (I have to stand on the railing of the deck to reach the lowest branches that Henry sits on. When he was full he flew higher up and off to join a group of other birds. Ha! :) Sweet Henry was going to be a big boy bird after all! Now he comes by most mornings for some breakfast and and a little chat. If I am out walking around he will fly from tree to tree to make sure I see him and follow him back to our tree for a snack. One evening he came by at dinner time and landed briefly on my head just to say hello. He has bird friends now that I see him hanging out with so I know he is learning how to eat on his own, belong to a bird family and really take care of himself. He seems to be doing well so far. And he still comes to the same tree and sits on the same branches most mornings. I was afraid that he might not be able to make the transition from being taken care of by a human into being an independent wild bird. But, he was able to and is doing very well. Henry is visibly happy to see me and enjoys coming to visit with me. I can tell how he flutters his wings and chirps wildly when he sees me coming towards him. I never realized how much joy a little orphaned sparrow could bring to my heart. I am thrilled that he knows he is a bird and lives freely as a bird and when he comes to say hello every morning, my heart still jumps with excitement and overflows with happiness.